What other names does the Nankeen Kestrel Have? Nankeen kestrels are another common vagrant to our shores from Australia, however unlike the Barn Owl they have never been recorded breeding in New Zealand. In Australia, like our New Zealand Falcon, the Nankeen Kestrel are often called Sparrowhawks, but other names include: Falco cenchroides, Australian Kestrel and the Windhover, the latter owing to their ability to hover in the air when searching for prey. What does the Nankeen Kestrel look like and Where does it live? 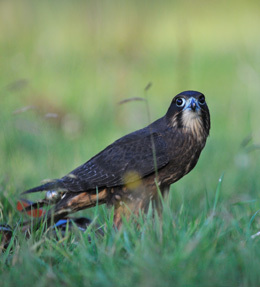 Arguably one of the cutest of raptor species at this end of the globe, they are far daintier than our endemic New Zealand falcon. In their native Australia they are relatively common all over the mainland. They are an open habitat species found along roadsides or on farmland. Like other kestrel species they breed in a variety of places including tree cavities, on cliff ledges and in large stick nests made by other bird species. 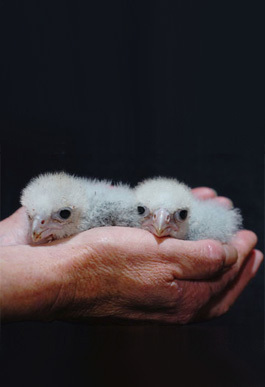 Nankeen kestrels feed on small birds, mice and insects. 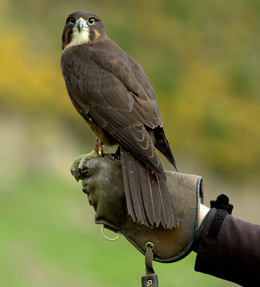 Their hovering hunting flight makes them easily distinguishable from the New Zealand falcon as does their diminutive size, pointed long wings and chestnut coloured back and black wing tips. They successively colonised Lord Howe Island in the '40’s and Norfolk Island in the '60’s. Due to a combination of the frequency of arrival in New Zealand, a track record of colonising other islands and an abundance of suitable habitat and food in New Zealand, it seems probable that a natural breeding population of this species may establish in New Zealand sometime in the future. Further, with the climate changes predicted, New Zealand may become even more suitable for this species. Regardless it is clear that the story of our native raptor fauna is ever evolving. Image Credits: Ben Twist / "A Nankeen Kestrel in Australia" - GNU Free Documentation License.